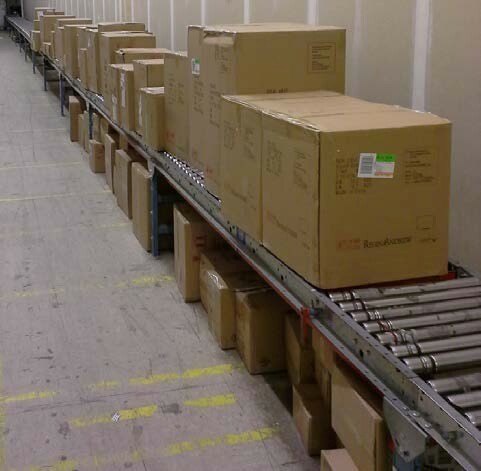 contact us when you need assistance with a conveyor system. We will work with factory engineers and you to design a system that works for you at an affordable price. 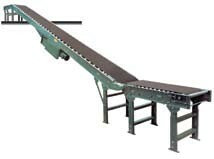 XR40 Minimum presure, Line-Shaft-Driven, live roller conveyor is quiet, efficient, economical to install and maintain. Product can be accumulated along the conveyor with independently driven rollers. The rollers are driven by elastometric belts that pull drive spools against the line-shaft. thus allowing slippage that allows for accumulation without damage to items being conveyed, or to the conveyor. Deluxe Systems works with Hytrol Conveyor Co. when specifying a Power Belt Conveyor system. 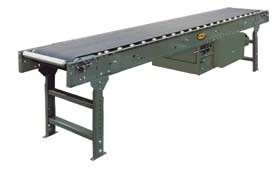 No other company has the experience, quality, or selection of belt conveyors that Hytrol does. Please contact us when you need a power belt conveyor system designed for your application. Equiped with an adjustable nose-over at the discharge end to ensure a smooth transfer from the incline to the horizontal plane. Product designed to move heavier loads. Roller bed design reduces belt friction and provides greater capacity. Applications include assembly, inspection, and packing operations. Contact us to have a representative contact you. Our representatives will work with your people and factory engineers to design a system that best fits your needs.